3D printing is transforming how products are made also in the pharmaceutical and, especially, medical technology sectors. The additive manufacturing process is quite complex and involves many different competences, from medical doctors called to prescribe the personalised intervention for each single patient to engineers working at the project, to software specialists that have to transform it in the form suitable to instruct the 3D printer to built the final object, to vendors of the 3D files. Material sciences are also a fundamental part of the game, as the properties of the starting materials used during the printing process are very different from those typical of bulk productions and have a great impact on the final characteristic of the product. The interactions among all these different stakeholder implies many regulatory and legal issues, both technical and regarding civil liability and intellectual property rights, that in great part still need to be clarified. The first 3D printed medicine (and the only one up to now) was approved in 2015 by the FDA, a reformulation of the anti-epileptic seizure drug levetiracetam developed by Aprecia Pharmaceuticals. Much more developed is the application of additive manufacturing in the field of medical devices, where the technique is already widely used to obtain, for example, personalised prosthesis on the base of the specific anatomical characteristics of each patient, or 3D printed scaffolds for regenerative medicine. A very interesting application of additive manufacturing, especially in the view of its possible future translation towards the production of pharmaceuticals, comes from the startup Multiply Labs and focuses on the automated production of 3D printed capsules containing personalised dietary supplements. Not surprisingly, the technology used by the Californian startup to obtain the controlled, retarded release capsules has originated from a long-standing tradition of research and development in the field of pharmaceutical technologies experienced by one of the founders during her university studies at the University of Milan, Italy (see here for more details). From the industrial point of view, an initial approach focused on dietary supplementation allows an easier regulatory development and lower barriers to enter the market for what appears to be a first-in-class technology offering many opportunities of further development also for the manufacturing of personalised medicines. The full exploitation of 3D printing techniques in the pharmaceutical industry is still hampered mainly by regulatory reasons. If the FDA has started issuing guidelines, up to now focusing on medical devices, in the European Union the development of a common approach still lags behind. The EU Parliament recently announced to intention to work on a new legislative framework regulating 3D printing in order to better ensure safety of products for users. 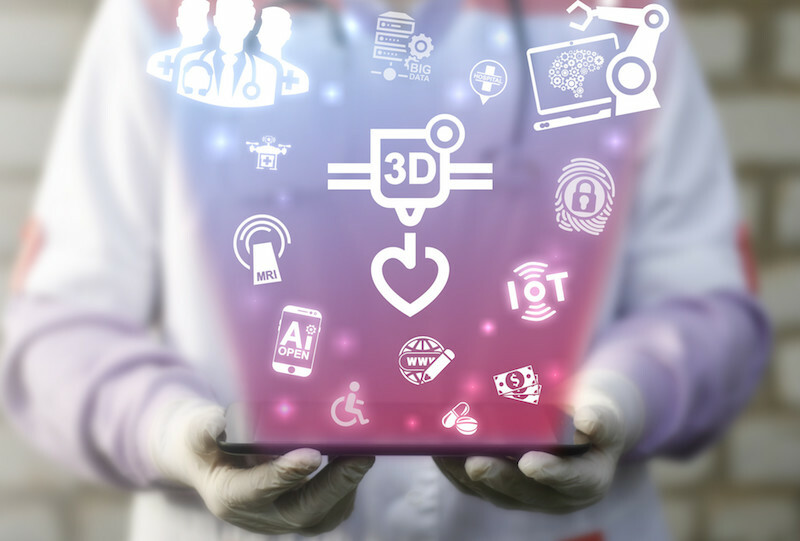 The guideline came after at least an hundred products had been evaluated by the US regulatory agency and it offers the first structured reference framework for the development and production of 3D printed medical devices. The FDA Center for Drug Evaluation and Research (CDER) also received at least a dozen (formal and informal) requests from pharmaceutical companies to address the use of this disruptive technology also in view of its application to the manufacturing of medicinal products, according to the editorial signed by FDA’s Commissioner, Scott Gottlieb. One possibility suggested by Mr Gottlieb is the possibility to use CDER’s Emerging Technology Program, aimed to support the rapid development of highly innovative approaches for design and production in the pharmaceutical field. The guideline for medical devices was developed with the support of the 3D printing facility internal to the CDER and the one installed at the Center for Devices and Radiological Health (CDRH), that tested the impact of the different options available to the regulator on the final quality, safety and efficacy of the devices. The guideline is a “leap-frog” document, just the first step based on the current status of development of this innovative approach to manufacturing, and it will necessarily evolve in future years. FDA Commissioner already announced the intent to further explore the role on non traditional production sites, such as hospitals or university labs, and to deepen the evaluation of 3D printing techniques used to obtain advanced materials containing cells or other biological materials. The first section of the FDA guideline is specific to the “Design and Manufacturing Considerations” to be taken in mind while developing the quality requirements for 3D printed devices and their regulatory classification. Flow diagrams can be used to better explain the complex synergy of technologies and materials involved in the manufacturing, and each critical step may be further detailed by a summary, including used parameters, their interactions and the impact on final product, and the output specifications. A clear knowledge of each passage of production is essential, according to FDA, to allow the proper identification of root causes and consequent risks in case of defects. A discussion of the impact of imaging and of the modification of parameters of standard devices in order to adapt them to the anatomical characteristic of the patient is also provided. The transfer of 3D files among the different players of the process presents also cybersecurity risks and protection of personal data that have to be considered during the development of the product. The guideline discusses also the requirements of the software used for additive manufacturing, as well as controls on starting materials and post-process controls and validation. Description of the device should always include its dimensional range, and critical dimensions that might undergo modification during patient-matched device’s production. 3D printed devices are subject to the same tests on the finished product as the one coming from traditional manufacturing, to be run after post-production, cleaning and sterilisation. Any worst-case choice of the device chosen for the tests have to be explained. The effect of the printing process and the positioning of the device within the internal “building space” of the printer should also be addressed, as they might impact on the final properties and functionality. Biocompatibility of the finished product should be tested according to ISO 10993, and chemical modifications of the starting materials should be discussed as well as the possible risks for health coming from the use of polymers. Adhesion and cohesion forces have to be characterised, as they play a fundamental role for the integrity of the device. An evaluation of the microstructure is also required for metallic and ceramic materials, and morphology examination for the crystalline ones. Swelling water content is required for hydrogels and in vitro degradation tests are needed in case of devices printed using adsorbent materials. Post-production removal of accessory parts has to be evaluated, as it might result complex as a consequence of the structure of the device, impacting on the results of sterilisation. According to the European Commission, by 2021 the 3D printing market could be worth € 9.6 billion. In the European Union there is still no specific guideline available nor for the additive manufacturing of medical devices nor for pharmaceutical products. The production of medical devices currently follows the same standards used for serial production and custom-made devices, respectively. The debate on how to regulate additive manufacturing is still at the beginning in the EU. As reported by EMA’s “Annual report 2017”, the EU Innovation Offices Network (EU-IN, voluntary established by 23 national competent authorities) started discussions on emerging areas of innovation with expected impacts on regulatory evaluation standards and practices in the pharmaceutical sector and novel manufacturing strategies, among which 3D printing. The European Parliament adopted on 3 July 2018 the report of French member Joëlle Bergeron containing legislative and regulatory recommendations in the field of 3D printing, at the level of civil liability and IP rights protection. The report will be now forwarded to the European Commission for consideration. According to Bergeron (see here an interview published on the Parliament’s website), even if the rules on civil liability expressed by the e-commerce directive currently apply also to 3D printed products, more specific rules would help to better identify – in case of accidents – the person responsible for the defect. The protection of property rights of designers and printers and the fight to counterfeiting should be further points of attention for the European legislators. According to the Bergeron’s report, 3D printing has not had a dramatic impact on copyright, but it “it would be wise to distinguish between home printing for private use and printing for commercial use, and between B2B services and B2C services”. A similar distinction is also suggested for liability, as civil liability is not harmonised and is subject to national legislation, while EU legislation covers more specifically civil liability for defective products. The suggestion made by the rapporteur is to pay a great attention in the definition of the accountability chain and the identification of those accountable when determining whether the general liability regime may continue to apply or not. “It will take many years and a good deal of expertise before high-quality products can be made which do not pose a risk to users or consumers”, states the report. Accident liability or intellectual property infringement are other point that would require the adoption of a new legislation at EU level or the tailoring of existing laws to the specific case of 3D printing. Some suggestions made by the document include the creation of a global database of printable objects to control reproductions of copyright-protected 3D objects, the introduction of a legal limit on the number of private copies of 3D objects to prevent illegal reproductions, or the imposition of a tax on 3D printing to compensate IPR holders. “None is wholly satisfactory on its own”, specifies there report.